Seven Card Stud Poker is a popular choice amongst poker players and as you would expect many of the reputable online poker rooms offer the game at various limits. It is a game for poker players with a good memory. It is important to remember the folding players hands in order to play the game at an expert level. 7 Card Stud Poker is a game with a maximum of 8 players. The game is always processing in a clockwise order around the table. Before the game starts all players must pay an ante to the pot before any cards are dealt. The ante reflects the limit of the table. In this example given below, a $1/$2 limit game. Each player is dealt three cards. The two first cards are dealt face down for only the player to see. The third card is dealt face up. The player with the lowest card makes a forced bet (bring-in) of either $0.50 half minimum bet or $1 full bet (players choice) to start the game. If two cards have the same value cloves starts the betting followed by diamonds, hearts and spades. The game continues in clockwise order and the rest of the players can choose to “call” the opening bet, “raise” it or “fold” their hands. 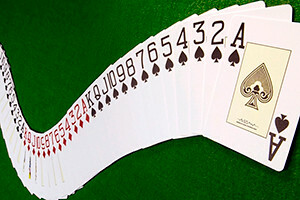 Remaining players are dealt a fourth card face up followed by another round of betting. The player with the highest card(s) is always first to check or bet. The betting on 4th street begins with a full bet $1. 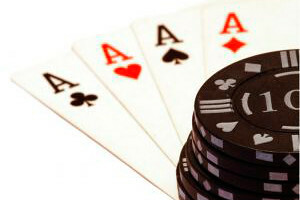 Remaining players are dealt a fifth card face up followed by another round of betting. On the 5th street the starting bid is minimum one big bet $2. Remaining players are dealt a sixth card face up followed by another round of betting. On 6th street the starting bid is minimum one big bet $2. The remaining players are dealt a seventh and final card face down. The player in the first position opens another betting round. Minimum bet is $2. After the betting round all remaining players turn their down-faced cards up to show which of the players remaining in the pot has the best hand. The best “poker hand” wins the pot. So just to recap the basic Seven Card Stud rules. There is a round of betting after the deal of the 3rd, 4th, 5th, 6th and 7th cards. By the river, players are holding three cards face down and the final four are face up. Thus, players can’t see your whole hand unless all bets are called (at showdown). Many poker rooms offer 7 Card Stud High/Low (Hi/Lo). For Seven Card Stud action we recommend 888 Poker, Poker Stars and Party Poker.